This collection bundles all 3 volumes of Susan May Warren's romantic suspense series Team Hope together in one e-book, for a great value! Ex-CIA operative Lacey Montgomery is a liar, a murderer, and a fugitive-or is she? Former Green Beret Jim Micah must either prove her innocence or bring her to justice. Too bad his heart won't stay out of the way. With a little girl's life and national secrets hanging in the balance, Jim and Lacey must trust God to help them flee the secrets of the night. Alaskan bush pilot Andee MacLeod has spent her life searching for the one thing that can stop her running-a family. Now Andee has one last flight to make before she heads down to the Lower 48 for the winter. But she has no idea one of her passengers is a terrorist. And another passenger is FBI agent Stirling "Mac" McRae. Mac and Andee are about to discover what it means to put their hope in eternity and God's plans, even in the darkest moments. 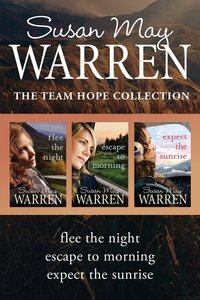 About "The Flee the Night / Escape to Morning / Expect the Sunrise (Team Hope Series)"
Book two in the Team Hope series by Susan May Warren, the name to watch in romantic suspense. In Escape to Morning, Homeland Security Agent Will Masterson crosses paths with Search and Rescue worker Dannette Lundeen. Will is working undercover to find and neutralize a terrorist organization threatening U.S. security. Dannette is searching for a missing girl, who turns out to be the key to the terrorists. As Will and Dannette put their lives on the line, they find their hearts drawn to one another. Only as they trust God and each other can they find a way to escape to morning. Book three in the compelling Team Hope series by Susan May Warren, the name to watch in romantic suspense. Alaskan bush pilot Andee MacLeod has spent her life searching for the one thing that can stop her running?? ?a family. Now Andee has one last flight to make before she heads down to the Lower 48 for the winter. But she has no idea one of her passengers is a terrorist. And another passenger is FBI agent Stirling ???Mac??? McRae. Mac and Andee are about to discover what it means to put their hope in eternity and God's plans, even in the darkest moments. Ex-CIA operative Lacey Montgomery is a liar, a murderer, and a fugitive?? ?or is she? Former Green Beret Jim Micah must either prove her innocence or bring her to justice. Too bad his heart won't stay out of the way. With a little girl's life and national secrets hanging in the balance, Jim and Lacey must trust God to help them flee the secrets of the night.